State law requires the organizers of the Preakness to hold the race in Baltimore, unless there’s an emergency. But Ritvo says crime and blight are keeping the track in Pimlico from greater success. Security guard Kevin Jones was fatally shot in June 2015. City Councilman Isaac “Yitzy” Schleifer, who represents the area near Pimlico, says a race track renovation plus connected businesses could help spur economic growth in the neighborhood. Schleifer says the Stronach Group is standing in the way of progress. Losing the Preakness would be a huge blow to the neighborhood’s rebirth, he says. Read more: Here’s a good overview of the money and politics involved at the Maryland Reporter. The Stronach Group is committed to keeping the Preakness in Maryland, if not at Pimlico, Maryland Jockey Club president Sal Sinatra says. The subject is bound to stir powerful emotions, says Anirban Basu, an economist with the Baltimore-based Sage Policy Group who has studied the Maryland racing industry. But in pure financial terms, he agrees with Ritvo that the Preakness could thrive at Laurel Park. On the other hand, the event would sacrifice some of its tradition and its quirky juxtaposition of corporate tents and college debauchery on the infield, he says. Rather than warning that it would require a “huge” commitment of state resources to keep the Preakness at Pimlico — and not acknowledging the “huge” amount of money the state is already sending their way as a result of the legislation that legalized slots and casino gambling — Stronach officials ought to be focused on finalizing an agreement with the Stadium Authority and the Baltimore Development Corp. on a second phase of the Pimlico study. Alert! American Pharoah has arrived at Monmouth Park for Sunday’s Haskell. Let the beautiful, absurd hoopla begin. Fans were there to greet him at the Atlantic City airport, and an even bigger crowd awaited him at the barn. The Triple Crown winner is about to make his first start since the Belmont Stakes. He looks sculpted, and if possible, even more of a beast than he did just seven weeks ago. Trainer Bob Baffert has worked him three times in 10 days. Tuesday, he breezed four furlongs in :48.80 at Del Mar. July 23, he worked six furlongs in 1:11, more than three seconds faster than the other 11 workers at the distance (a group that included 5-year-old Grade 3 winner Bal a Bali). “He keeps getting stronger,” Baffert said in Tuesday’s NTRA teleconference. 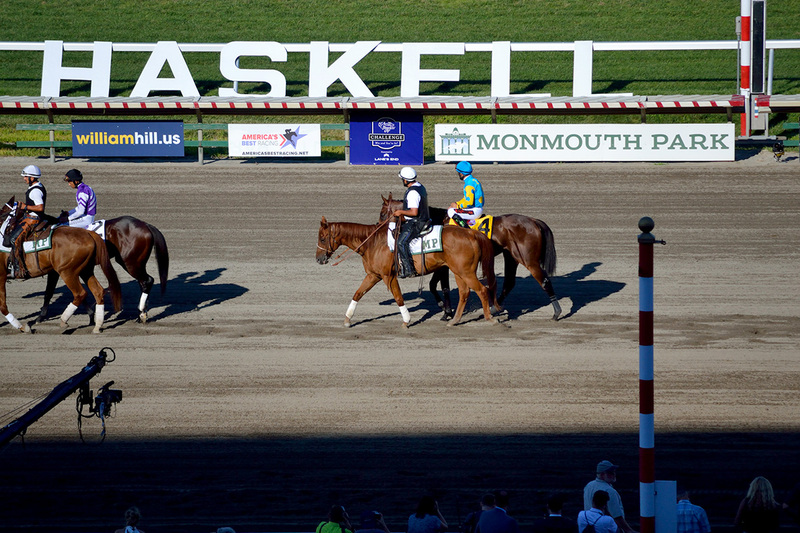 Monmouth Park Racetrack has announced a $750,000 purse increase to the William Hill Haskell Invitational, which is to be renewed for the 48th time this Sunday, Aug. 2. The Haskell runner-up will earn more than about as much as the Jim Dandy winner ($350,000/$360,000). Trainer Rick Violette was swayed by the added money, telling David Grening that Upstart will go to New Jersey. … recognizes the prestige of a Triple Crown winner running at Monmouth. “I don’t know where they’ll put all the people,” said trainer Bob Baffert (DRF+).